Billy Yarrow's late try secured Dewsbury Celtic an 18-10 success at Woolston in National Conference Division Three. Celtic are developing the knack of registering tight away wins and, having pipped Millom seven days earlier, they prevailed at Woolston. The were level at 10-10 when the game went into the final quarter and Rovers looked likely winners when Celtic’s Danny Lee was red-carded after 61 minutes. However, Danny Thomas’ men edged in front with a Charlie Heaton penalty and then secured victory with Billy Yarrow’s late try, plus Heaton’s third goal. James Walker and Tommy Dunford had crossed earlier for the visitors while Justin Becker and Daniel Griffiths were Woolston’s scorers with Billy Maunder adding a conversion. Celtic return to Crow Nest Park on Saturday when they target a third straight victory as they look to maintain pressure on the top two sides Waterhead Warriors and Leigh East when Heworth are the visitors. Dewsbury Moor are finding life in Division One difficult following back-to-back promotions and the young Maroons slipped to a third straight defeat as they went down 40-6 to high flying York Acorn. Acorn were 18-0 ahead at half-time, thanks to converted tries by Antony Chilton, Tim Stubbs and Lewis Brown. The Maroons opened their account 10 minutes after the restart when Aiden Ineson crossed for a try which he improved but York upped the tempo to end any hopes of a come back as they pulled clear. The home side added further tries by Lewis Lord, James Mountford, Joel Johnson and Reece Rushworth, with Chilton completing a six-goal tally as York moved into third place, just behind 100 per cent leaders Pilkington Recs and second placed Normanton Knights. 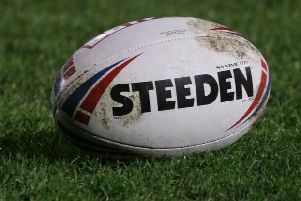 Moor will hope to reverse their fortunes on Saturday when they return to Heckmondwike Road as they entertain mid-table Wigan St Patricks, who have won two and lost two of their opening four matches and went down 19-12 at home to Milford last week.